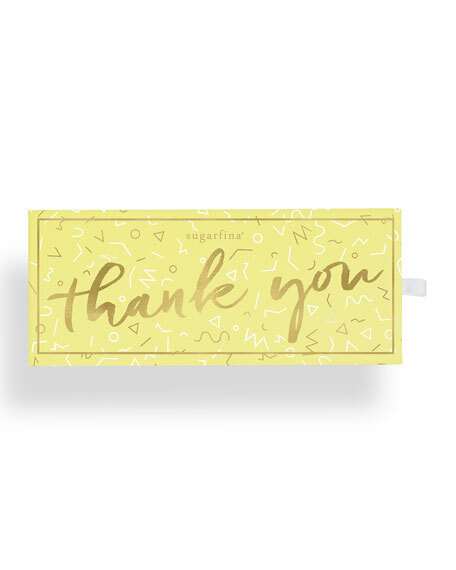 Sugarfina® "Thank You" Bento Box®. 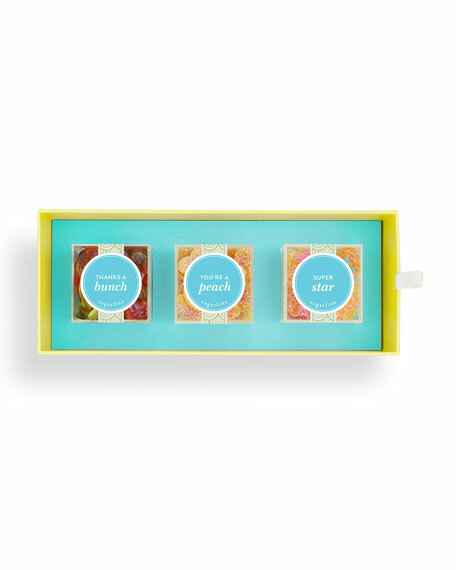 Three Lucite® cubes filled with Thanks a Bunch, You're a Peach, and Super Star gummies. 9.5"W x 3.25"W x 2.75"T.
12 different gummy bear flavors in cupcake container. 4"Dia. (widest; 3" at bottom) x 6"T. 1.45 lbs total. Made in the USA. Allergen Information: Manufactured in a facility that processes tree nuts, peanuts, milk, soy, eggs and wheat. Chocolate Tackle Box includes: milk chocolate pretzel poppers, dark chocolate-covered almonds, chocolate covered gummy bears, dark chocolate-covered raisins, chocolate-covered cookie dough and white chocolate nonpareils. 7.5"W x 5"D x 1.5"T. 1.53 lbs. total. Made in the USA. Allergen Information: Contains dairy and nuts. EXCLUSIVELY AT NEIMAN MARCUS "Hopelessly Devoted to Candy" soda fountain cup filled with malted milk balls. From the Grease™ Collection. EXCLUSIVELY AT NEIMAN MARCUS "Hopelessly Devoted to Candy" soda fountain cup filled with malted milk balls. From the Grease™ Collection. 3.5"Dia. x 7.5"T. Made in the USA. Allergen Information: Contains milk, soy and wheat. Packed in a facility that processes tree nuts, peanuts, milk, soy, eggs, and wheat.